1 of 3 In a large bowl, whisk together flour, baking soda, ginger, cinnamon, cardamom, cloves, pepper and salt. In a separate bowl, beat butter and brown sugar 2 minutes, until fluffy. Beat in egg and molasses until just combined. Add flour mixture and beat until just combined. Divide dough in half and shape into disks; wrap tightly in plastic. Refrigerate 2 hours. 2 of 3 Heat oven to 350 degrees . Remove one dough disk from refrigerator. Generously flour work surface. Roll out dough to 1/4-inch thickness. 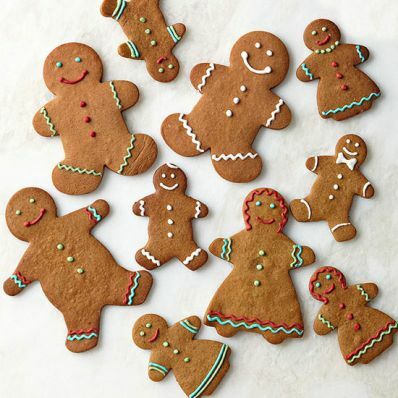 Cut into gingerbread men and women with 3-inch cookie cutters. Place on baking sheets 2 inches apart. Use pastry brush to remove flour from cookies, if desired. Refrigerate 15 minutes. Repeat with second dough disk. 3 of 3 Bake at 350 degrees in batches until golden brown, about 14 minutes. Cool on wire racks, then decorate, if desired.